When I bought these new decorating tips, the first thing I noticed is how huge they are (see yesterday's post). It worked fine! And I was off to the races. 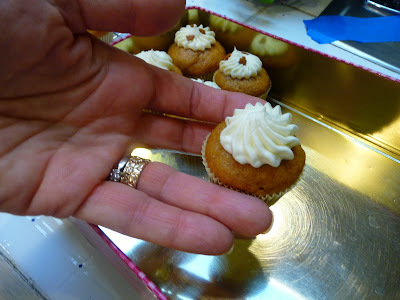 As I went along, frosting and squishing and racking up the mini cupcakes, I thought about how easy it is to decorate cupcakes and cakes if you know a few little tricks. So, here they are, to demystify the process and inspire you, I hope. Tip #1: Improvise. (See above paragraphs.) Decorating with frosting is too darn fun (and too darn tasty!) to let a little thing like the lack of a plastic thingummy stop you. 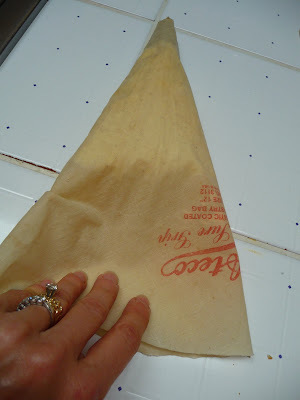 If you don't have any pastry bags or tips, stuff the frosting into a zip-style plastic bag, snip a tiny bit off one corner, and go free-form with your stylin'. 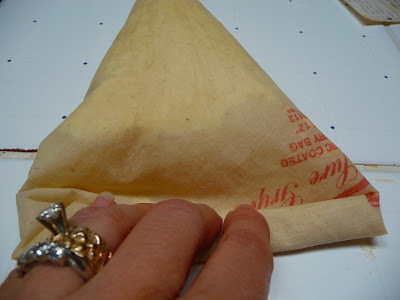 Tip #2: Use the cuff-and-glass method to fill a pastry bag with frosting. Roll the bag's larger end down over itself to form a generous cuff. 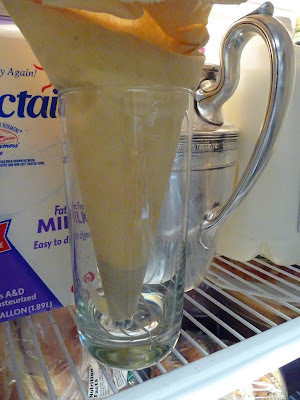 Then stand the empty bag upright in a tall drinking glass. Now filling the bag with frosting is a snap. 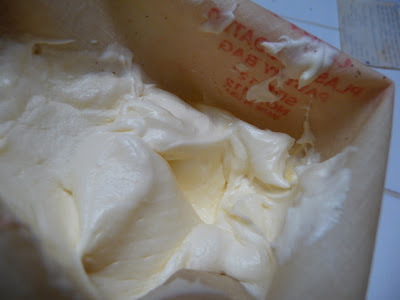 Here's a shot of the Cream Cheese Frosting in the bag. Yum-mee! 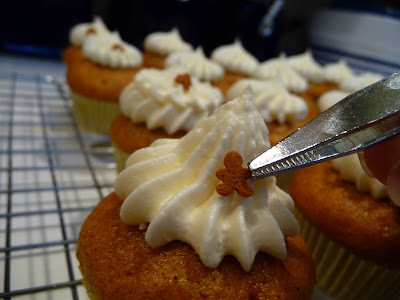 Tip #3: Gently push the frosting down toward the tip by lying the filled pastry bag down on a counter. This gets rid of any unwanted air pockets. If you try to do this while holding the bag in the air, frosting can shploop out either end, and you don't want that! And yeah, I said "shploop." Tip #6: Practice making decorations on a plate before you start decorating. You can always scoop up the frosting and stick it back in the bag. Or, save your ugliest attempts for yourself and your family/best friends. Like this one, below. It's too peak-y in the middle and looks...stupid. So it became part of my lunch! 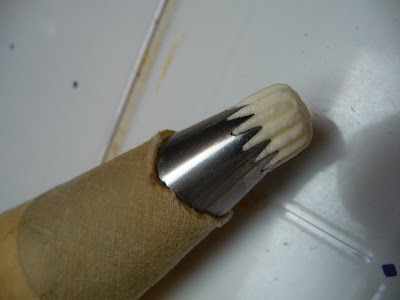 Tip #8: Use tweezers for precise placement. No, not the ones from your bathroom! 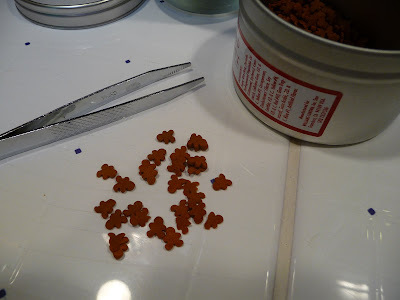 Buy an inexpensive pair of tweezers from the drug store and dedicate them to strictly cake- and cookie-decorating use. 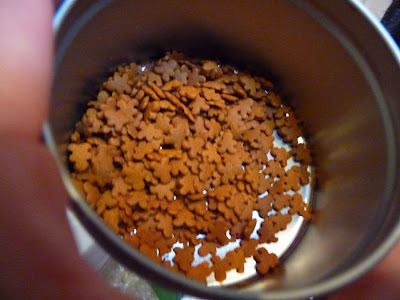 And when you're picking through irregular shapes like these gingerbread folks, spread them out on a white surface so you can sort through them easily and weed out any oddballs. Unless you like using oddballs, of course. 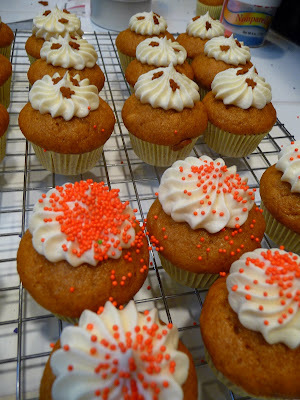 So after doing some ginger people, I sprinkled some of the mini-cakes with mini orange balls (see below). Tip #10: Move the cupcake, not the pastry bag. Remember when you were in 2nd grade and Mrs. Ratchley said the best way to cut a difficult shape out of construction paper is to hold the scissors still and move the paper around? Same thing applies here. 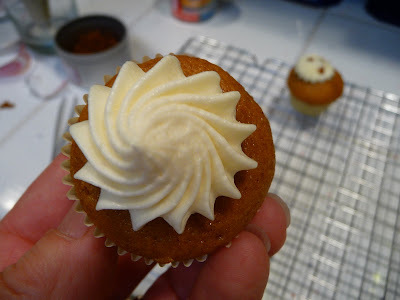 To achieve this swirly shape below, I used the same pastry tip as before but held the cupcake in my left hand (I'm right-handed, so the bag of icing goes in your dominant hand). 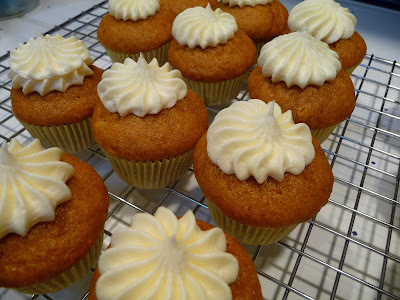 Then I cocked my left wrist, and as I applied the icing, I slowly "unwound" my left hand as I piped out the icing. That works much better than trying to twirl the hand that's holding the icing bag. It has enough to do, believe me! Pretty, huh? I picked up the next tip from watching the pros at Trophy Cupcakes in Seattle. 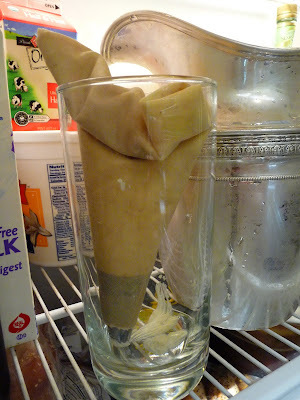 Tip #12: Don't throw out leftover icing! There are so many fun things you can do with it instead. Pipe a big button of icing to attach two cookies together and create a sandwich. Ice a short greeting like "Hi!" or "I [heart] U" on somebody's pancakes or waffles. Squeeze a little icing on a slice of pear or apple for a fall treat. Melt a square of chocolate atop a Graham cracker in the microwave, and add a healthy blob of icing instead of a melted marshmallow, then top with another cracker. In a large mixing bowl, cream together granulated sugar and mayonnaise. Add eggs and beat thoroughly. Sift together the flour, baking powder, salt, baking soda, and spices. Alternately add dry ingredients with the pumpkin [and raisins and nuts, if desired] to the batter. In a large mixing bowl, beat the first three ingredients until light and fluffy. Gradually add the sugar until smooth. If the frosting seems too thick, add a few drops of milk to thin it out. Makes enough to fill and frost a three-layer, 9-inch cake. Hee hee! There's still frosting in my refrigerator! Question about the pumpkin spice bread recipe -- what does the mayonnaise do? Would it be possible to substitute it with yogurt? Mayo is mostly made of egg and oil, and of course both of those are commonly found in quick breads and cakes. My guess is you could substitute the 1/2 cup mayo with 1/4 to 1/3 cup of a very mild oil, like canola, and maybe one more egg. You could probably add 1/3 to 1/2 cup of plain yogurt on top of that without significantly altering the recipe, but you might want to try these substitutions and additions first before you make a batch of cupcakes to take to the office! BTW, I've made this recipe using full-fat mayo and Best Foods Light Mayo, and both work equally well. Good luck, and thanks for reading our blog! 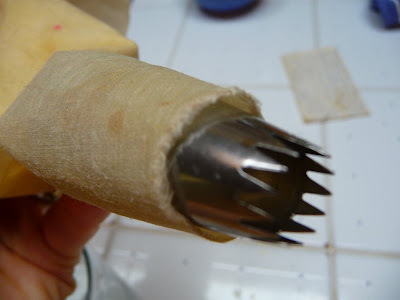 I just started to play with pastry tips and I looked on the internet and found you. Thank goodness. 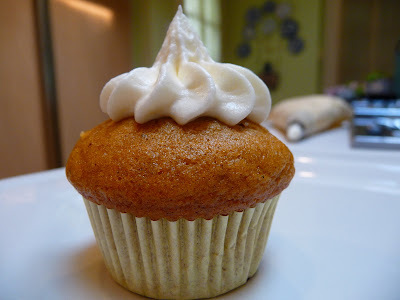 I am starting a party on my blog called "Cupcake Sunday" one Sunday a month. I have never put frosting on with a bag before and thought I should learn. I'm a total beginner. 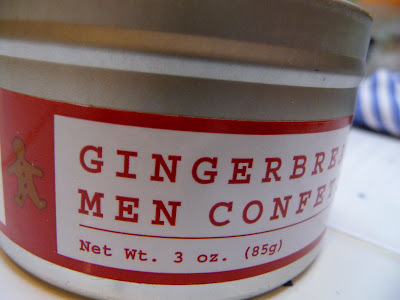 I wanted to take some cupcakes to church once a month, but didn't want to eat all of them. So up came the idea. 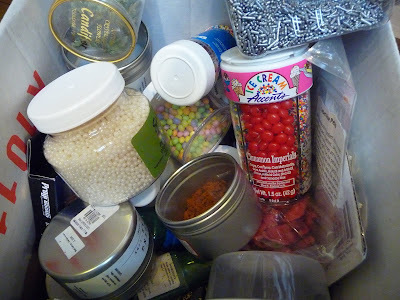 Today I am baking and wanted experiment. Thanks for the hints.